The PR2000RT2U Smart App Sinewave UPS from CyberPower is designed for corporate applications, featuring line-interactive topology, surge protection, and battery backup capabilities. Configurable in a tower or rackmount form factor, it utilizes sine-wave output, active power factor correction, and automatic voltage regulation to eliminate power gaps for sensitive equipment. Its eight power outlets are all surge- and battery-backup-protected to keep your devices running during power spikes and emergencies. Should your devices be damaged in the event of a power surge, CyberPower provides a connected equipment guarantee of up to $400,000. A line-interactive UPS has an autotransformer that regulates low voltages (e.g., brownouts) and over voltages (e.g., spikes) without having to switch to battery. Provides clean, consistent AC power by automatically increasing voltage without using battery power when incoming power fluctuates. An advanced charging process that maintains the voltages of the batteries at the same level to prolong battery life. Allows UPS batteries to recharge faster via a built-in charger. Adjustable for better viewing and provides information on 47 different settings that include UPS status, UPS setup and control management, and testing options. The faceplate features side latches for easy removal, and captive screws can be loosened by hand to open the battery cover for quick replacements. Prevents power surges that travel through telephone, coaxial, and/or Ethernet lines from causing damage to electronics. A patented design that allows utility power to bypass the UPS transformer, when AC power is stable, which reduces energy consumption, noise, and heat buildup. Included mounting accessories allows for horizontal rack or vertical tower installation. A free downloadable software that offers IT professionals tools for monitoring and managing the UPS and backup power. This software offers remote management functionality. 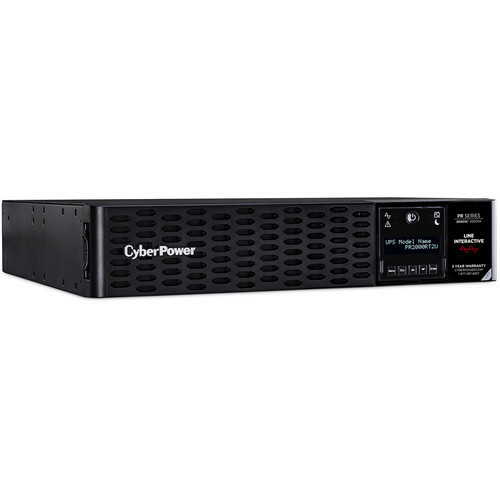 CyberPower will repair or replace properly connected equipment, up to $400,000, if it is damaged by a power surge. Box Dimensions (LxWxH) 22.25 x 20.3 x 10.6"